The social media reaction to Wigan Athletic’s 2-1 defeat at Derby County. Mason Bennett and Scott Malone’s second-half goals helped Derby County come back from behind to beat Wigan Athletic at Pride Park on Tuesday. 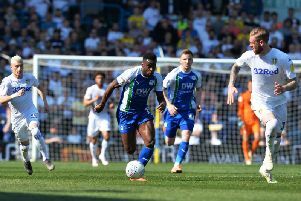 Gavin Massey gave Latics the lead in the 25th minute when he rounded-off an exceptional counter-attack with an assured finish under former Wigan shot-stopper Scott Carson, but the Rams fought back after the break. Bennett levelled the tie with an extraordinary acrobatic effort on the hour mark before Malone completed the turn-around with just 12 minutes remaining with a simple finish from close-range. Latics slumped to their 15th away defeat in all competitions this term and are still without a victory on the road since August 22. Despite the defeat, Paul Cook’s side stayed put in 19th place and remain three points above the drop zone as the final 11 games loom. Wigan fans gave their verdict on social media after their 2-1 defeat against Frank Lampard’s Derby County.